The Pit Bull may be going from top dog to stray mutt. Oscar De La Hoya’s Golden Boy Promotions has signed Andrei Arlovski to fight in a 6-round boxing match for its June 27 show. The fight is scheduled for the undercard of the event featuring Chris John vs. Rocky Juarez. Here’s the kicker: since it is an undercard fight, it may not even make it on TV. I suppose Fedor will do that to a guy. I wonder if Arlovski thinks he has taken MMA as far as he can, or if he thinks boxing is an easier payday. I also wonder how much a fighter gets paid for a six-round match on an undercard. The Pit Bull won his last 5 before Fedor, and 4 of them were KO’s. 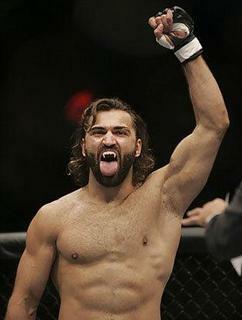 One thing I do know: Andrei Arlovski nor any other MMA fighter can ever make boxing exciting to me again. I doubt that Arlovski will be back in the UFC, at least not anytime soon.